Mores Creek Summit Backcountry Skiing: Dec 8-10 Storm - Let it SNOW! Great news for this upcoming weekend. 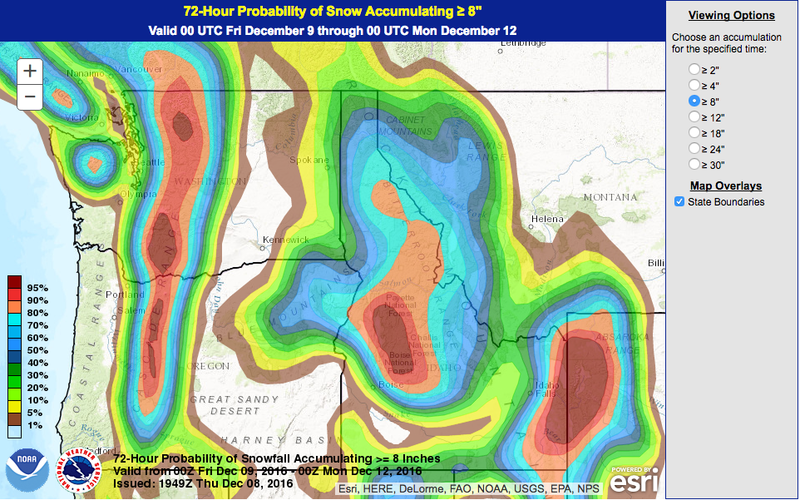 It is likely that by late Saturday we might have as much as 20 cms of new snow. Other forecast products predict as much as 50 cms. Below a forecast product, I find helpful. It is hard not to notice the where the probabilities exceed 95% - right by Mores Creek Summit, Banner Summit, and Big Creek Summits. And these areas happen to be backcountry skiers playgrounds! Gosh, I can hardly contain my excitement ... Snow and snow and snow is coming to our mountains! I was getting tired of hearing about snow in other states and countries. It has been a while since I shared informative maps of MCS. I think that today's posting is ideal. We can look at this maps of Pilot and Freeman Peak and daydream. And imagine where we would be skiing. During the next few week, I will be generating final pdf files and be providing links for folks to download these maps of MCS. Next - slope angle map. It is such an important part of ski touring and riding snow. Slope angles are responsible for BIG smiles. It is important to realize that not all of the slope needs to be steep to slide. If a slope has an avalanche starting zone of 35-42 degrees, it is possible for the avalanche to be triggered and to continue moving at shallower angles. For the map included above, areas in red have angles between 35-42 degrees, in orange between 28-35 degrees, in yellow 20-28 degrees, and green below 20 degrees. This map allows to easily identify uphill tracking routes to Pilot and Freeman Peaks. Once in the terrain, it is better to measure slope angles. And with today's phones and great slope angles apps, there are no absolutely no excuse not to know the slope angle before dropping in. Other times we want to know where the snow stays cold and protected from solar radiation. A map with Northerly aspect is helpful. Some other times we are interested in an estimate of how the snow is distributed in the landscape by winds during precipitation events. Few of us are working on that question at Boise State University. Below a preliminary output for an algorithm I had been playing with. This algorithm attempts to graphically illustrate the areas where the snow accumulates or ablates. Blue color indicates where the snow accumulates. Red colors show where the snow is blown away by the wind. The output below assumes winds from the SW during the precipitation event. During the next few weeks, I will be doing a depth measurements at Mores Creek Summit to test this model. The Pioneer fire impact on MCS has been a usual topic of conversation. Next map showing the extent of the area burnt at Pilot Peak. 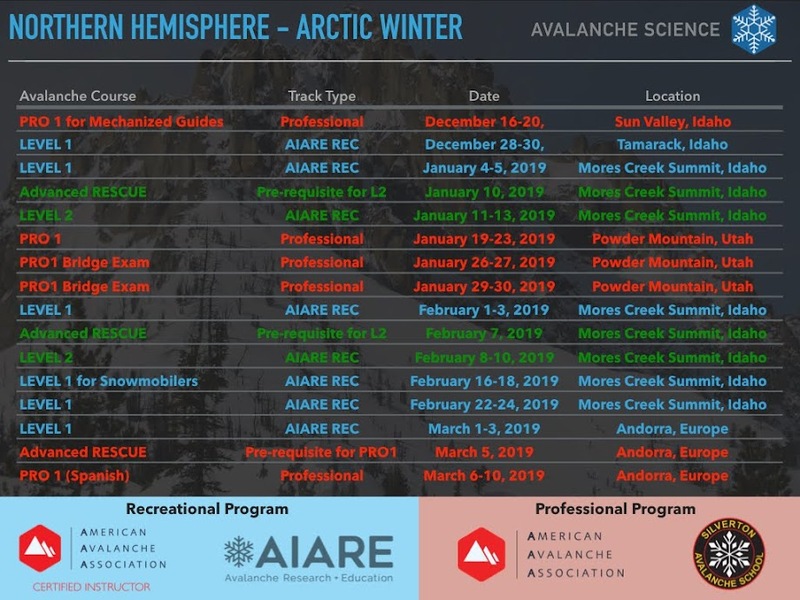 Changing gears - I have been to a number of professional avalanche educators workshops as well as snow science/avalanche conferences where it is discussed decision making in the context of groups. Unusual to me (I love to talk) I choose to remain silent. I believe most folks know how to make GOOD decisions. Of course, we make mistakes and that is not going to change. The key to consistent good decision making is having relevant information. And good information requires situational awareness. Lately, I have seen a good intention focus about how to get folks going to the backcountry to make better decision in groups. I rather see more effort about how to make the group better inform and improve their situational awareness. I have seen so many groups, many with avalanche education, being led by the most articulate, self-appointed leader, for all practical purposes nullifying group decision. And life has provided too much evidence that of bad group decision making. Hence, I am skeptical of the power of a group thinking to make good decisions consistently. Especially when more often than not, there is a lot of misinformation and in particular a lack of situational awareness within the group. Politics provides many examples of this; Nazi Germany, Trump election, and the list go on. In theory, well-informed groups should consistently make good decisions, but that is not the case in real life. Map knowledge is one of the fundamental pillars to be well informed and develop situational awareness about the landscape in which we travel and ski. Maps are essential for planning. Perusing over maps in their various forms makes us experts in that area. Similarly, reading about weather forecasts, reviewing forecasters discussions, and contemplating at weather maps is another pillar of situational awareness. Spending time analyzing weather forecasts familiarizes us with what the atmosphere will do (snow, winds, rain, temperatures, visibility, ...) and how the landscape, topography and WEATHER interact. The message is that if we want to maximize our enjoyment while in the mountains and be safe we need to improve our situational awareness skills. And a great start is to be obsessed about having the best maps and sourcing the best weather forecast products of the areas we backcountry ride. Not only we will be minimizing avalanche risks, but we will be maximizing the FUN factor by selecting locations to ride the most awesome pow! Be safe out there this weekend. Remember we have several weak layers now buried deeper in the snowpack. Check the previous posting for details.